While in Chicago, I received several calls from Archaia staff congratulating me and informing me that Mouse Guard Winter 1152 made the New York Times Best Seller list for hardcover graphic novels! Obviously I am thrilled and amazed to have Mouse Guard or my name in the same sentence as "New York Times Bestseller". The Winter collection debuted at #4. We will see what the coming weeks will hold. 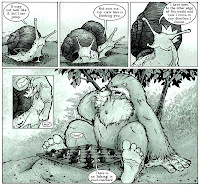 I have become a BIG fan of Karl Kerschl and his webstrip the Abominable Charles Christopher. For me Karl is making a strip on the level of Calvin and Hobbes. Don't click the link looking for a direct comparison of strips though...what I mean is that he has a full emotion range (from HAHAHA, to Awwww, to sob!) and his draftsmanship on par with some of the top in the visual storytelling field. So I was thrilled when he offered to let me do a guest strip! It was a few weeks ago now, but here is the link. At my spotlight panel in San Diego, I talked about the upcoming Mouse Guard: Black Axe series. CBR covered the panel and you can read their report here. The basics of the new series are: It's a prequel, It will have 2 familiar mice from the Fall/Winter stories as younger mice, They travel off the map, and the series will start early next year. I also wanted to share this image that I teased at the panel. I gave away this free print to all the fans in San Diego. I'm thrilled that my publisher and the Jim Henson company have teamed to produce new stories of Henson properties (Dark Crystal, Labyrinth, Fraggle Rock, etc, etc, etc....) but also to create new material together. I was fortunate enough to not only be a part of the panel in San Diego that announced the partnership, but I was asked to do the poster artwork for the announcement featuring the Dark Crystal! Creative teams for the books have not been announced yet other than the news of Brian Froud doing covers and creative direction for Labyrinth and Dark Crystal. I do not have any of these posters, Archaia is the only source, but I did hear rumblings at Archaia that it may get reprinted for future cons. You can read coverage of the panel at CBR. 1. Is the animal in the background Rampaul(sp?) the weasel, or Anivory(sp?) the Ferret, or is it just some other weasel, or can you even tell us at this point? 2. 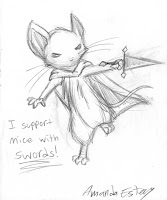 Will the series start with Celenawe as a mouse in the guard, or already The Black Axe, or should I just wait and be surprised? 3. Was Conrad a member of the guard in Fall 1152 or just some one who lived at the outpost of Colegero? Was he ever a member of the guard? I'm assuming not because he is lacking a guard cloak. 4. Is the mouse to the right on the poster a member of the guard? If so, could he/she possibly be Odell? 5. Will we see hide or hair of Kenzie, Saxon, or Leaim in this series? Reprint the black axe promo!!!!! Wow, NY Times best seller! Well deserved. Congrats on all your success! I just bought the Dark Crystal poster from the San Diego comic con!! It cost me a bit on ebay but well worth it, and now um going to look for the black axe promo!! I hope someone sells one!! TwiceBorn: I'm glad you won't be upset, because I con't answer any of these for you yet. (meaning that while _I_ know the answers, I'm not reay for YOU to). I will say that 1)there is a published image of Annivory already. 3)the inside front-cover text of Fall chapter 2 will answer your Q.
I too hope the Black Axe print will be printed again! On one hand, it annoys me that people are profiting off these things on eBay. As someone not able to make it to the con, I still want the chance to be able to purchase such items, and want to support the artist rather than fill the pockets of resellers. On the other hand, there's the idea of numbered editions, and online demand would potentially just be too great for those... also the idea of con exclusives ties into that, and that I understand, and I'm very grateful to David for making his sketchbooks available through the blog after the con. But if the artist doesn't sell something online, I'm happy that eBay gives me the chance to buy something. I bought Mike Mignola's 2009 sketchbook from eBay for example, and when I first learnt about his con sketchbooks last year, I was lucky enough to buy last year's and also one previous one as well. I love his artwork and I'm not aware that he sells them offline. On the third hand... the matter at hand... I've been watching for a Black Axe print on eBay for a few weeks now, and haven't seen a single one show up yet. This was the first I'd actually seen what it looks like, and I have to say it looks awesome! I think that if you could 1) make a quality product so the fans are happy, (not just to sell something for the sake of making money), which I totally believe would be the case but 2) you WOULD make some money from it, so it'd be worth your while and 3) it's not overly time consuming and taking time away from actually making the comics... then I think it's a good thing to do. That's quite the combination of conditions and so in some cases it works, and perhaps in others it doesn't. It's been wonderful over the past 5 years to have found out about such amazing storytellers and artists as David, Jeff Smith, Terry Moore and others who publish independently or through smaller studios and have blogs and really keep in touch with their fans online. So it's also great to have ACC mentioned here again. When you first posted about it David with your guest strip, I went over there and read the whole thing from start to finish... I was hooked! Now I'm back there every week for the continuing adventures. It's a wonderful comic; his art and coloring are beautifully detailed and his visual style is very strong and uniquely his own, and the full emotion range you refer to is indeed the strength of his storytelling. I'm very excited that he's prepping his first book collecting the strips! I'm willing to pay big money for a black axe promo print!!! If there is anyone on ebay selling I'm buying!! I'm all for The Black Axe poster reprint as well for the record. I think I know what image you're referring to about Annivory David, and I also think I know which is which between the poster and that image. As for the Black Axe promo, I got an extra one for a friend of mine but that was it at the presentation. There really didn't seem to be that many in the hands of the lady giving them out and I'm not surprised David doesn't have any left spare. Wow, I'm excited to see more weasels (living ones this time!) in The Black Axe. I plan to pick up the Winter 1152 hardback and any sketchbooks you may have at the Windy City Con. Looking forward to reading the Epilogue. Keep up the great work! Whoop! I can get my comics signed! Looking forward to seeing you at Paradise Comics here in Toronto!Congratulations on the NYTs!! That's amazing and it doesn't get any bigger than that.I love Karl Kerschl's work!